A new study finds that light-colored rooftops can help California cities save water by requiring less of it for lawns and gardens. The recent work from researchers at Lawrence Berkeley National Laboratory, says that the widespread adoption of "cool roofs" could reduce outdoor water consumption by as much as 9 percent. 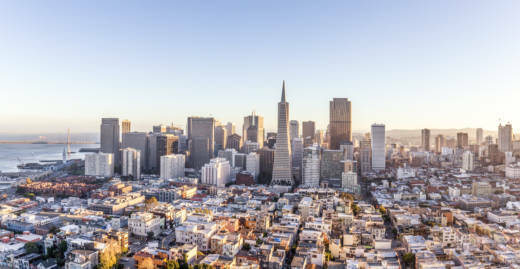 The study, published in the journal Nature Communications, marks the first body of research to look at the link between water and heat mitigation strategies in urban areas, says co-author Pouya Vahmani, a scientist at Berkeley Lab. The average temperature of cities with high concentrations of cool roofs can drop by 3 to 4 degrees, which, as the Mercury News reports, is enough to save cities like San Francisco from about 4 percent to more than 7 percent of the water used per person daily for landscaping needs. The authors calculate that a wholesale transition to cool roofs could cut water use by more than 9 percent (83 million gallons per day) in Los Angeles County and save more than 7 percent in Sacramento, San Francisco and San Bernardino. The concept, which could cost homeowners between $6,000 to $15,000, has its skeptics. “I don’t think a single roof with asphalt containing reflective granules will do much,” Alex Bergeron, vice president of Teal City Roofing Inc. in San Jose, told the Mercury News. Vahmani emphasizes that significant results would require widespread adoption. "What was surprising was the significant amount of water being saved,” Vahmani said. “Our study gives cities another reason to consider widespread implementation of ‘cool’ roofs." Eventually, researchers say they want to expand their area of focus to agriculture. The study is part of Berkeley Lab’s Water Resilience Initiative, which focuses on the connections between water and energy use.